The ETA Trust is currently working with the Royal Borough of Kingston upon Thames to help deliver Back on a Bike style road shows to promote cycling as part of their Go Cycle programme. Following a successful bid to become a Mini-Holland borough, Kingston was awarded a share of £100 million from Transport for London to be spent on revamping its cycling infrastructure and improving public spaces for cyclists and pedestrians. While work gets underway to install ‘hard measures’ such as two-way segregated cycle lanes and improved bicycle parking, Kingston Council has also put a range of ‘soft measures’ in place to ensure that residents are made aware of the Go Cycle programme, and the many benefits it will bring to the borough. 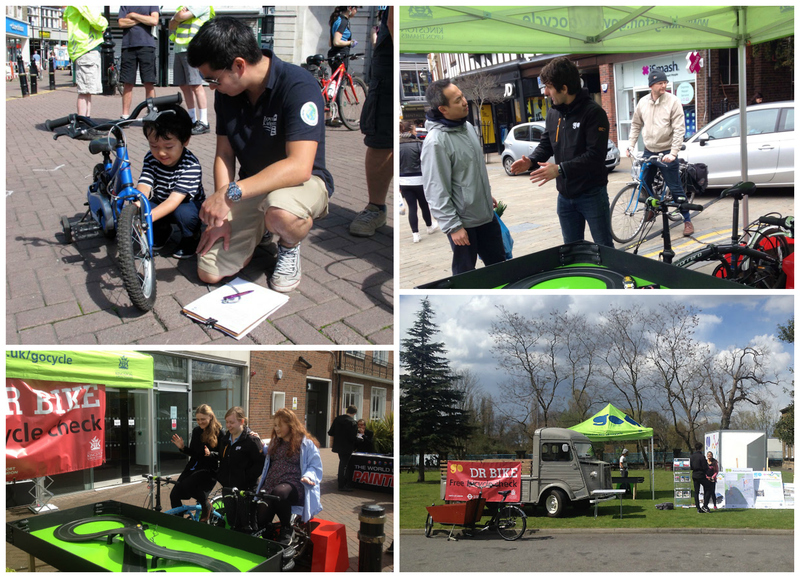 Over 25 years’ experience in promoting cycling made the ETA Trust an ideal partner to help Kingston deliver their aims for the project, and as such they have adopted the Back on a Bike concept, translating it into a vehicle for spreading the word about Go Cycle. The result: an eye-catching mobile road show providing free information about the scheme and encouraging people to take up cycling by introducing it in a stress free, off road environment. Delivered by our vintage Citroen H Van (pictured) and manned by a group of keen cycling advocates, the Go Cycle mobile road shows offer something for everybody. Clear information about the programme is displayed and handed out, and local residents are encouraged to share their views on planned developments. Children and adults alike can enjoy a special bicycle powered scalextrics track and are offered useful cycling freebies such as reflective bands and water bottles, while ‘Dr Bike’ mechanics are on hand to provide free bike checks for passing cyclists. Residents who do not currently cycle are also encouraged to engage with the project, and are offered access to information on cycle training and bike loan schemes being run by the council. For the ETA Trust, helping Kingston deliver these Back on a Bike inspired road shows will provide an invaluable opportunity to develop and refine the concept, without deviating from its original aim of reacquainting people with the simple joys of cycling. Are you a local authority, business or enterprise with an interest in encouraging people to cycle? If so, find out more about Back on a Bike and feel free to get in touch.